The Admit Card is the most important document as per the candidate's point of view. The Hall Ticket is essential for the candidates proof of candidature. The IPPB Hall Ticket #yearfor Prelims Exam is expected to get released on the official website of IPPB in the month of October 1970. The IPPB Admit Card gets usually released 15 days before the exam. The IPPB #yearHall Ticket for the Mains Examination is expected to get released in the month of January 2020 through the official website. 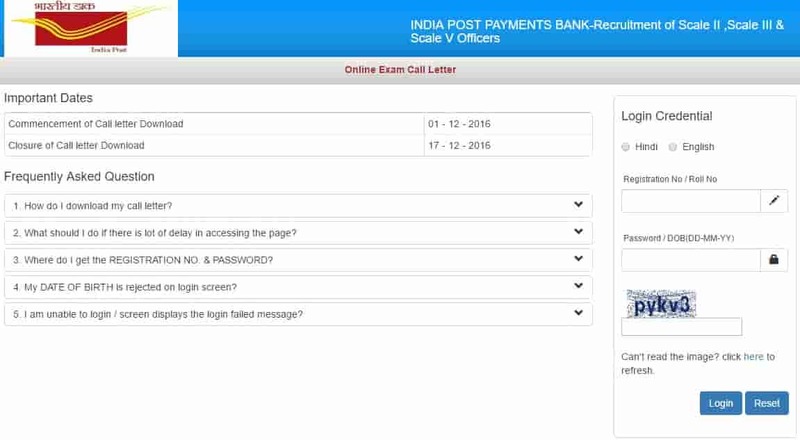 For downloading the IPPB Exam 1970 Admit Card, the candidates have to fill the Registration Number and the password and click on the "Submit" tab. The candidates need to go to the same website where they registered for the IPPB Exam i.e. the official website. The candidates have to log in with the credentials which are the registration number and password. Afterward, they have to enter the security code and click on "Submit" option to advance. The candidates will be directed to a new page where they will get their IPPB Hall Ticket displayed. The Admit Card will be displayed in PDF format. The candidates should check the whole Admit Card/ Hall Ticket for the mistakes. If the mistakes are found, they can report to the authority. However, the mistakes after the "final submission" of the Application Form cannot be corrected. But for clearing the doubts and further guidance, the candidates can look forward to the authority. If the candidates do not find any mistakes in their IPPB Admit Card, then they can click on the download symbol and the download will get started. The aspirants can also take the print out of the Hall Ticket on an A4 size paper and keep it safe for accompanying it in the IPPB Exam. Note: The IPPB 1970 Hall Ticket has to be carried by the candidate to the Exam venue. If the candidate fails to do so, then he/ she would not be permitted to enter the examination hall.